I don't even remember why I requested this book from Netgalley but it was a whim worth taking. 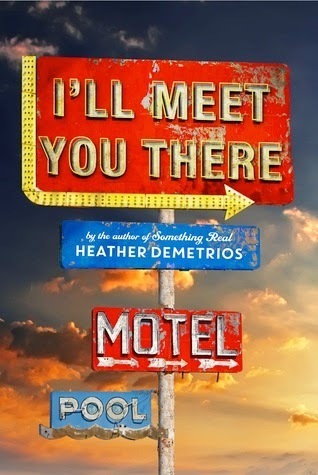 I really enjoyed I'll Meet You There by Heather Demetrios. I loved the small-town setting and the desperation to get out. I loved the main character and her relationships with her down-on-her-luck mother, her two best friends, her boss, and especially her budding relationship with Josh. After reading this book I will definitely be looking out for other books by Heather Demetrios. This story is mostly told from our main character, Skylar, a teen girl living in small town, Creek View, with her dreams and days numbered to when she'll be leaving for San Francisco and university. It's all she's been working for for the past few years, getting out and living a life outside of the trailer park and away from dead-end jobs and this small town. Interspersed between Sky's narrative are some short, emotional letters from Josh, a Marine who has returned from Afghanistan with his leg blown off writing letters to one of his Marine buddies. All of the relationships are really interesting. While the relationship between Sky and Josh is the one most explored and developed, I also really loved the dynamic between Sky and her two friends Chris and Dylan. Chris and Sky are both leaving for university but Dylan will remain in Creek View with her infant son. I also thought Marge was an amazing character. She's sort of a surrogate mother to both Sky and Josh and she provides such a great level of emotional and practical support to them both. I loved Sky and Josh utterly and completely. They're not perfect and they mess up and do stupid things and I still loved them and my heart broke for them constantly. The start out as sort-of friends and then things begin to change between them as they spend more time together working at the Paradise Motel. I felt like everything between them was so believable. Their reasons for staying away from each other, their fears about where this relationship would go and how it would affect their dreams. It was really emotional and I was crying at several points in their relationship. I thought Josh's experiences were in particular were really interesting to hear about. His reoccurring memories of events in Afghanistan, his guilt over his friends' deaths over there, his thoughts on returning. It was important, I think, to know of these things. Especially as the author included really serious and saddening facts in the back of the book about the mental health state of returning soldiers. While I absolutely loved most of the book, I also felt like there were so many emotional highs and lows between Sky and Josh in this story that any ending between them would be anticlimactic but other than that I really enjoyed this one. Sounds like this one will put you thought the emotional wringer a fair bit. Yes, it definitely did that for me! This sounds gorgeous - I really want to read it now! I loved Heather Demetrios' fantasy novel, Exquisite Captive - I think you'd enjoy it too.